It’s been a long time since I first mentioned our landscaping project. We’ve moved at a glacial pace…lots of thinking, waiting, budgeting, thinking, waiting… Then we spent the majority of the summer traveling, so all projects were put on hold. But I’m excited to report that Phase I is finally a reality! To refresh your memory: Our backyard has some serious drainage problems. Rain water and runoff flows from our neighbors’ lots on three sides into our low-lying property. Our ejector pumps also used to discharge under the patio and straight under the back lawn, causing erosion and subsidence of the soil over time. 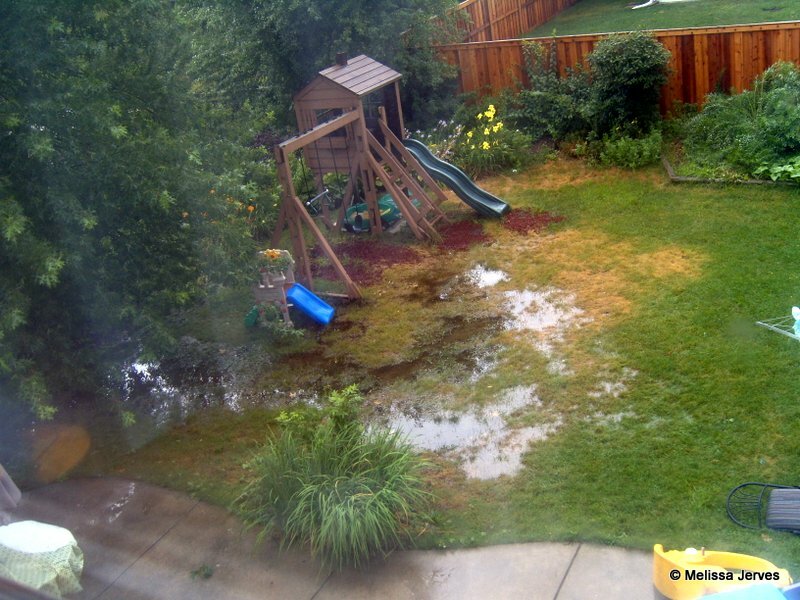 Every time we had a rainstorm, we had a swampy yard and standing water in some places, often taking weeks to drain. Grass wouldn’t grow, the lawn was bumpy, and the kids couldn’t go out and play without returning soaking wet and splashed with mud. We have been so happy working with Dig Right In these past few months. They listened to our concerns and our vision for out outdoor space. They designed a complete plan for us (both a drainage plan and a landscape design), and then broke it down into phases so that we could prioritize and make some progress within our budget. What I most appreciate is their willingness to view the project as long term and to work within the reality of the budget we have at the moment. They are also committed to creating sustainable, Earth-friendly landscapes and educating homeowners about chemical-free lawn care and conservation practices. So where are we now? We decided for this phase we would focus on improving the drainage. Jeff mapped out a swale to direct the water coming into the back of our property and move it (along with water from our downspouts and ejector pumps) toward the storm water sewer on the street in front of our property. The crew began by removing some of the larger “weed trees” and out of control shrubs around the perimeter of the lot. 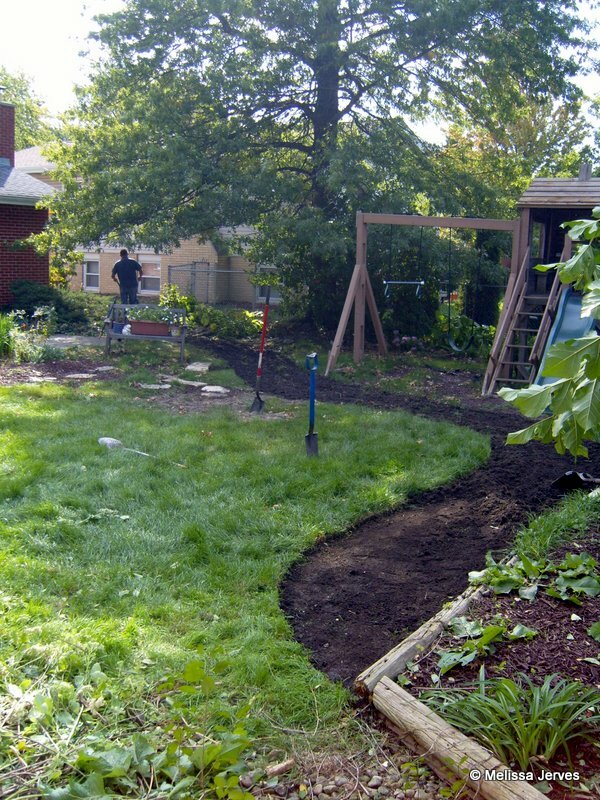 Then they started moving the soil to create a channel for the water and keep it out of the center of the lawn. They added new sod to the swale to eliminate erosion, and in a future phase, we’ll also have a dry streambed of stones and rocks. What else do we have to look forward to in future phases? To complete the drainage plan, Dig Right In will create a domed lawn for us so rainwater runs down into the swale and doesn’t pool in the grass. They’ll help us create some new perennial beds around the patio, reusing many of the plants that we already have. They also gave us a beautiful design for the front yard. The progress they made in a single day has really motivated us to get out and do some of the work ourselves. My dear friend Jen came with her shovels and helped me dig out the large overgrown bed along the east side of the back yard that is destined to become a vegetable garden. (Let’s be real: I helped her.) We trimmed branches, dug up yucca plants with their gigantic roots, eradicated more purple loosestrife, and pulled out countless day lilies to give away. I weeded several more beds (some more thoroughly than others), and we borrowed a chainsaw so that we can continue to cut down the overgrown shrubs and hedges. It’s a work in progress! We recently cleaned out our yard, and started a container garden. I love watching things grow!